Colonies of Tetragraptus quadribrachiatus, from the University of Oslo. In preparation for this post, I have been attempting to develop an understanding of graptolite branching patterns. This is not something that should be attempted lightly, if at all. If anything in this post seems confused, it's because it is. The Tetragraptinae were a group of graptolites that lived during the Lower Ordovician, and formed part of the early radiation of planktonic graptoloids. In one of the earlier phylogenetic (or at least quasi-phylogenetic) classifications of graptolites, that of Fortey & Cooper (1986), the tetragraptines (including the genera Tetragraptus and Pseudophyllograptus) were recognised on the basis of what was called the 'Tetragraptus serra proximal type'. In an earlier post, I explained how graptolite colonies grew as a series of branching zooids (individuals). The colony section for each individual zooid is called the theca, and graptolite workers usually refer to the thecae in discussions rather than the zooids (as the zooids are generally not preserved in fossils). A developing colony starts with the initial larval zooid, called the sicula. Out of the side of the sicula grows the first mature theca, which is referred to as th11 (the sicula is not included in the thecal count because it has a different growth pattern from the sequential thecae). The second theca, th12, then buds off from th11. The third theca to arise is th21, then th22, then th31, and so on and so forth. If all these bud in a simple sequence, the colony is not branching. However, if one or more of these basal thecae is what is known as a dicalycal theca (it produces two daughter thecae instead of just one), the colony branches. In most tetragraptines, th12 is a dicalycal theca, as are its two daughter thecae, so the mature colony has four branches. The basal canals of th12 and th21 crossing over the sicula, plus the proximal part of th22, make the lower part of the proximal region very robust: this massiveness is what characterises the Tetragraptus serra proximal type. Other characters listed by Fortey & Cooper (1986) as synapomorphies for the Tetragraptinae, reclined colony branches and a reduction in the number of branches, were also found in other lineages. 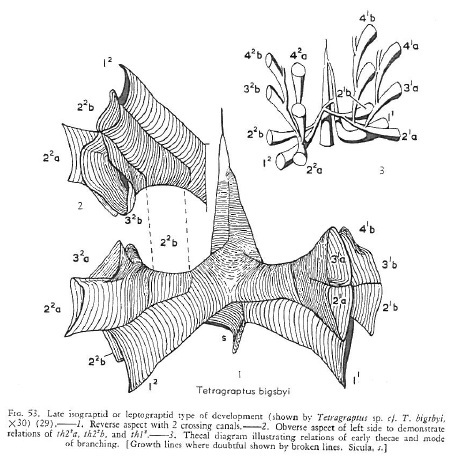 Proximal region of Tetragraptus bigsbyi, showing robust morphology, together with diagrammatic representation of thecal connections in early colony. From Bulman (1970). 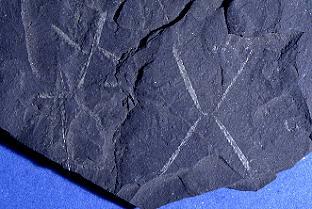 The Tetragraptinae were one of a number of groups of Ordovician graptolites with four-branched colonies, though other taxa lacked the T. serra proximal region. In a phylogenetic analysis of graptoloids, Maletz et al. (2005) identified four-branched graptoloids as a single clade that they called the Tetragrapta. This is in contrast to Fortey & Cooper (1986), who placed these taxa at a number of places in the graptoloid tree. The analysis of Maletz et al. (2005) differed from that of Fortey & Cooper (1986) in being a computational analysis rather than being constructed 'by hand'. Some characters given high weight by Fortey & Cooper (1986), such as the presence of a structure called a virgella, were found to be less significant by Maletz et al. (2005). However, in some regards the coverage of the latter study was less complete than the earlier. Most notable for the present post is that Fortey & Cooper (1986) had also included 'Dichograptus' solidus in the Tetragraptinae. This species apparently also has the T. serra proximal region, but also has more than four branches in the colony. It is possible that its inclusion in a computational analysis would weaken the association of four-branched graptoloids as a clade. By the end of the Ordovician, the graptoloid lineages with multi-branched colonies were extinct. There have been numerous suggestions for why this may have happened—buoyancy issues or competition between zooids are among the front runners—but for the rest of graptoloid history, simplicity would become the watchword. Bulman, O. M. B. 1970. Graptolithina with sections of Enteropneusta and Pterobranchia. In Treatise on Invertebrate Paleontology Part V 2nd ed. (C. Teichert, ed.) pp. V1-V149. The Geological Society of America, Inc.: Boulder (Colorado), and the University of Kansas: Lawrence (Kansas). Fortey, R. A., & R. A. Cooper. 1986. A phylogenetic classification of the graptoloids. Palaeontology 29: 631-654. Maletz, J., J. Carlucci & C. E. Mitchell. 2009. Graptoloid cladistics, taxonomy and phylogeny. Bulletin of Geosciences 84 (1): 7-19. I am a graptolite worker who is working on their phylogenetics, so I was pleasantly surprised by your blog post! I don't often get to read blog posts about tetragraptids, unless I write them! I was an undergrad in Chuck Mitchell's lab, which produced the Maletz et al. paper. Just to add some additional information, yes, more taxon sampling would help, however preservation is very poor for most early graptolites, particularly for the dichograptids, a diverse group only represented by Clonograptus on the Maletz et al. tree. So unfortunately, the Maletz et al. represents a statement about what we know of their relationships without adding species that are only poorly preserved. For example, based on Cooper and Fortey (1983) I don't think we even know if D. solidus has a virgella or not... its remains are completely flattened. Fortey and Cooper (1986) included many of these taxa and sorted them along branches based on branching pattern, without regard to the missing data. Yet we know branching pattern can be very homoplastic in groups that we have better character data for. Maletz (2011) looked at the question of the virgella as a general homologous character and found that different lineages have very different constructional approaches to making the spine, suggesting that just knowing a species has a virgella is not very systematically useful. Also, the loss of branches thing is true, but note that graptoloids several times re-figured out how to make new branches via 'cladia'. So, while there was evolution toward losing true dichotomies, there was also evolution to regain multiple-branched colonies. Weird, eh? I should add that I support the Maletz et al. tree as a statement of our current understanding; there will always be more taxon/character sampling to do. Also, not really certain to what extent D. solidus could be said to have a serra proximal end, given that we can't make out the branching order among the thecae. It seems like Fortey and Cooper may have just meant it had a tetragraptus-like branching pattern. Also, one of the odd things about the Maletz et al. tree is how the tetragraptids come out as sister or derived from the paraphyletic didymograptids. Most people previously would have thought it was a simple progression from many-branched dichograptid to four-branched tetragraptid to two-branched didymograptid... The Maletz et al. tree suggests this isn't the case, but again we still have to worry that if we could see more characters on dichograptids we might get a different story. Cooper, R. A., and R. A. Fortey. 1982. The Ordovician graptolites of Spitsbergen. Bulletin of the British Museum (Natural History), Geology series 36(3):157-302, pls. 1-6. Maletz, J. 2010. Xiphograptus and the evolution of virgella-bearing graptoloids. Palaeontology 53(2):415-439. Thanks a lot for your comments, David!